Well, yes and no, but we’ll get to that in a minute. With a new 3.0 litre V6 TDI engine, there are more important things to talk about first and foremost. Going off the beaten track, Volkswagen has taken any real effort out of off-roading. The Highline 3.0 V6 TDI we tested offers 254hp via eight-speed automatic gearbox and permanent four-wheel drive. It is refined and smooth and when the ignition key is turned you’re greeted with a nice muted rumble, with 0-62mph achieved in just 7.4 seconds. With 580 Nm of torque at your beck and call too, there’s plenty of power there to get you out of any jam. With its huge dimensions (1,620mm wide by 1,555mm long and unladen weight of 3,290 kg), the truck rides really well and most surprisingly there is no discernible bounce or body roll when you’re not hauling. With plenty of grip thanks to the permanent 4Motion four-wheel drive, the steering is precise and responsive and it has one of the best turning circles in the segment. On top of that, the rear leaf-spring axle soaks up any bumps and uneven surfaces you may encounter. Though the acceleration is quick, it can sound a little angry under a heavy foot looking for a hasty escape. Regarding noise, there is also a fair amount when travelling at cruising speed due to the huge wing mirrors which unfortunately means the refinement doesn’t last when you hit the motorway. It’s a subtle balancing act between the type of comfort and mod-cons you would expect from a traditional VW passenger car along with the hardiness and hard-wearing interior you would expect from a pick-up. Going off the beaten track, Volkswagen has taken any real effort out of off-roading. Thanks to the combination of leaf-spring rear axle, low-range automatic gearbox, mechanical centre-and-rear differential locks and traction control, this all results in even the most panic-inducing off-road situations dealt with by nothing more than a heavy foot and a turn of the wheel. Just like any other everyday manoeuvre. It is quite simply built for purpose, and that purpose isn’t necessarily for executives to use in lieu of a saloon for tax reasons. So, with overall performance out of the way, back to that whole ‘premium pick-up’ thing. 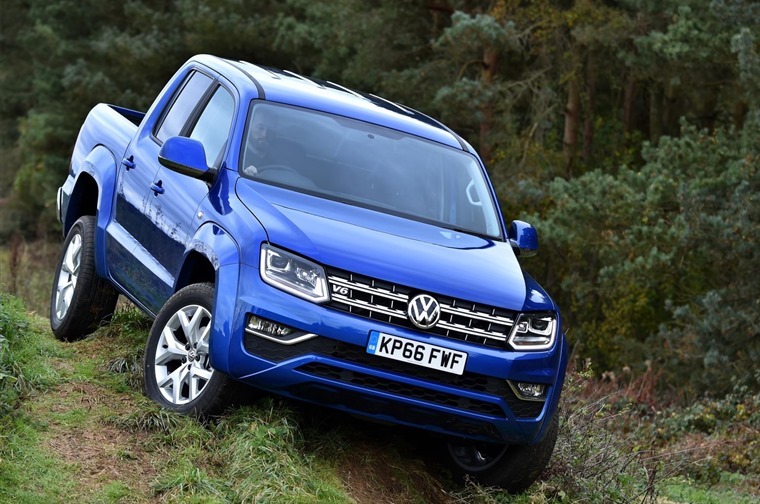 For the record, Volkswagen has never marketed the Amarok as such. In comparison to the likes of the highly capable Mitsubishi L200, Nissan Navara and Toyota Hilux, the interior is a step above and it’s easy to see why people championed the vehicle when Mercedes-Benz made the claim. It’s a subtle balancing act between the type of comfort and mod-cons you would expect from a traditional VW passenger car along with the hardiness and hard-wearing interior you would expect from a pick-up. So while you may get heated seats, air conditioning and cruise control as standard, you also get slip-mat flooring in the front to deal with muddy boots as well as hard plastic dashboard trim. Elsewhere around the cab, there’s a 6.3in touchscreen infotainment and satnav which comes as standard with the Highline trim. While usable it can seem a bit fiddly due to the relatively small size. If worse comes to the worst, Volkswagen’s App-connect system can run the likes of Google Maps from your smartphone. It’s quite simply built for purpose, and that purpose isn’t necessarily for executives to use in lieu of a saloon for tax reasons. 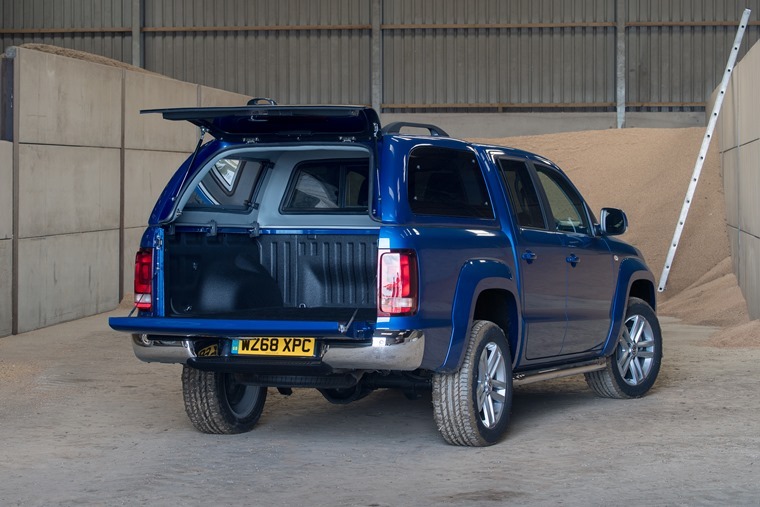 If anything, the Amarok was the first pick-up for the foreman or forewoman, meaning it’s a slight step above what was traditionally offered elsewhere in the segment. That level of functionality comes into its own at the rear. With a decent load space of up to 1,112kg it is the largest load bed in the double-cab sector. Alas, it suffers when it comes to towing capacity, offering up to 3.1 tonnes despite the roaring V6 TDI engine at its disposal. In spite of all this, it is a pretty efficient truck. Official figures state a combined 33.6mpg and our own figures weren’t too far off the mark hovering around the 30-33 mark. Additionally, CO2 figures come in at a 220g/km. 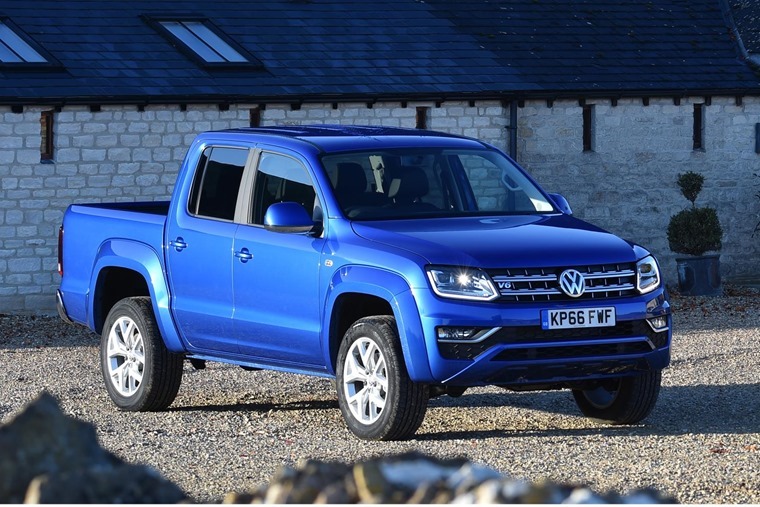 In closing, it’s safe to say the Volkswagen Amarok still has its place. Some pick-ups are more capable, some offer a little more luxury, some offer better performance, but few offer better driveability. And that’s the beauty of the segment, there’s something to fit every need whether it’s for work, rest or play. 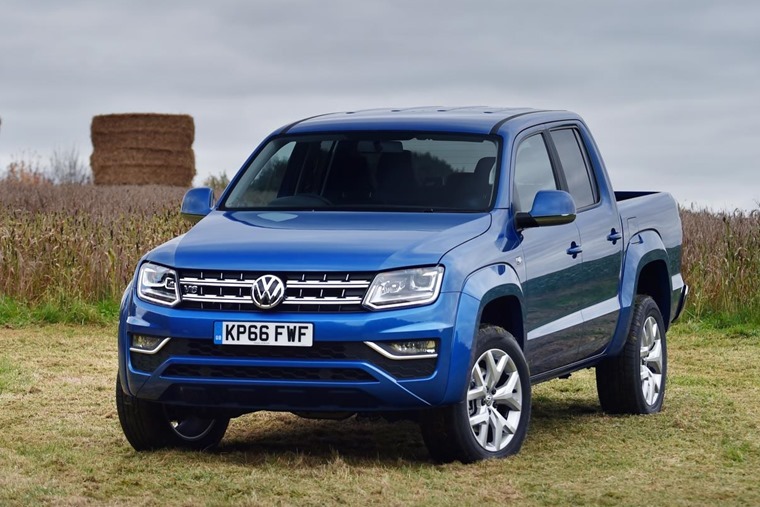 The Amarok exudes the rugged and tough image of a pick-up, albeit with enough flourish that you know it’s a Volkswagen at heart such as featuring the marque's trademark front end. As one of the widest chassis in the segment, it looks more imposing than others too. Features front and rear parking sensors, stainless steel sidebars and Bi-Xenon headlamps as standard. 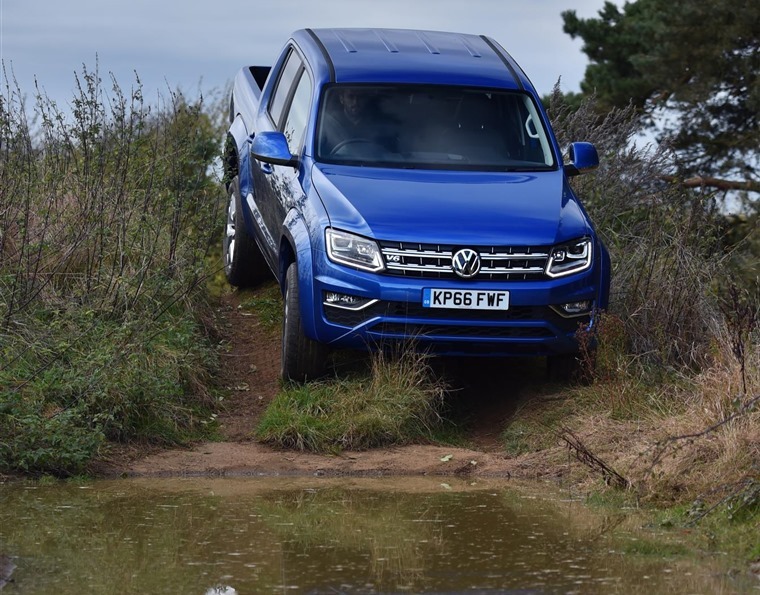 Functionality is the name of the game, and so the Amarok is a subtle balancing act between the comfort and mod-cons of your traditional Volkswagen and the hardiness and hard-wearing interior you would want from a pick-up truck. Air conditioning, cruise control and heated seats all feature as standard. A comfortable and capable cruiser, the Amarok features car-like handling and thanks to its wide stance and low profile is one of the most sophisticated drives in the segment. Off road, it remains capable and able to handle any terrain thanks to permanent four-wheel drive system. Plenty of room for front and rear passengers, and a great load-limit of up to 1,112kg. Measuring 1,620mm wide by 1,555mm long, it also offers the largest load bed in the double-cab sector. Official figures state a combined 33.6mpg and our own figures weren’t too far off the mark. With 580Nm of torque at 1,400rpm and upwards, there’s plenty of grunt from the V6 to get you moving quickly. CO2 figures come in at a 220g/km.